Dongfang City is an industrial port at the mouth of the Changhua River. 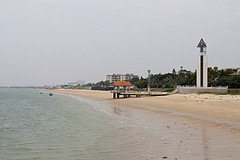 Dongfang is one of six county level cities of Hainan. It is in the western part of Hainan. During the second world war the Japanese set up a prisoner of war camp here to hold prisoners from Australia, Holland and China. The Japanese used the prisoners as labourers to set up mining nearby and also to build the railway to Sanya. The port is busy with the main export being iron ore.